Whether you're a seasoned pro or new to digital stamping, you're in for a treat with these spooky new digi designs we're releasing today! Digital stamps are a great alternative to physical stamps. You simply purchase, download, resize to your preference and print so you can color as many copies as you'd like. A few of our favorite digis from this release and samples are shown below. Click the link to shop the full release, and let's get crafting! 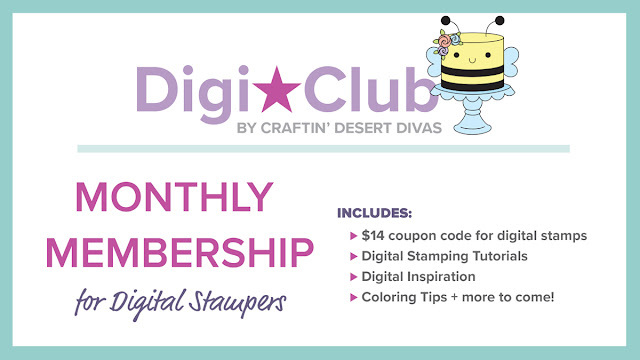 If you LOVE digital stamps, we think you'll love our DigiClub! Get $14 in digital stamp credit for just $7!!! Click here for more details. Be sure to let us know which designs you decide to try in the Craftin Desert Divas Gallery Facebook Group! Thanks for stopping by!